From here until the end of time (ok, just the end of summer) don't be surprised if I talk about how sad I am that summer is basically over in every single post. Guys, I'm so sad! Like, how did this even happen?! Can't deal. Summertime sadness aside, there is one thing that I won't be sad to see go- eating in swimsuits. I know that sounds weird, but I have to be totally honest, there is nothing that I dislike more than being dripping wet in a bikini for a cook-out at someone's pool/beach/lake. I always feel weird, gross, and judged 10 times more than usual for eating that second cheeseburger....with bacon....with potato salad (it's ok, I know you're just jealous because you want to be eating that too!). Also, I find it highly comical that girls won't eat to fit into bikinis to wear to places where they're going to be eating. Anyone else with me on this? Obviously, barbecues in bikinis are nearly unavoidable so this grilled vegetable salad is part of my solution. 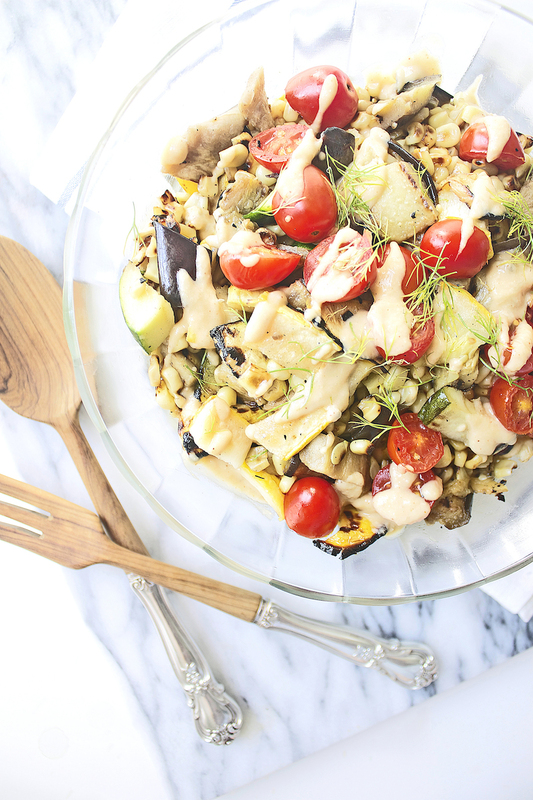 It's quite possibly one of the easiest salads you can make as it is simply grilled vegetables chopped up then topped with a light dressing made from hummus (a great base for creamy dressings when you don't want to use mayonnaise). This salad is healthy, light and fresh and definitely swimsuit approved! And since swimsuit season is almost over, don't worry, this salad is also clothing approved! First, wash and slice your squash, zucchini, and eggplant. Toss it with a little olive oil and proceed to grill as you normally would. The vegetables should take about 5-7 minutes per side. Once they're done, remove from the grill and set aside to cool. To "grill" the corn, add a dash of olive oil to a medium-sized skillet set over medium heat. Add the corn and cook for 10-12 minutes, or until it begins to char, making sure to stir every few minutes. Remove the corn from the pan then toss the tomatoes in and cook for a few minutes. Once the grilled vegetables have cooled, chop them into small pieces. Add to a serving bowl and toss with the corn and tomatoes. To make the dressing mix the hummus, olive oil, vinegar and lemon juice together. Stir until well combined. Drizzle the dressing over the salad, sprinkle with salt and pepper and finish with shredded dill on top. Toss right before serving. Store any leftovers in an airtight container for up to a week. This salad is tasty on it's own for a lighter meal, but it would also be good with a nice crusty bread (almost like a bruschetta), served alongside fish or steak, topped with grilled tofu, or sprinkled with some goat or feta cheese. This recipe can easily be doubled or cut in half. The vegetables can also be substituted based on preference. The vegetables can be grilled the night before and stored in the fridge until you are ready to use them the next day. If you do not have a grill, or it's too cold outside, you could also use a grill pan or roast the vegetables in the oven.